Hi There! If this is your first visit, be sure to check out the FAQ by clicking the link above. You will have to register before you can post: click the register link above to proceed. To start viewing messages, select the forum that you want to visit from the selection below. We hope you become a regular here! We are a friendly bunch, and there's tons of great information in here. One of my biggest obstacles over the past 20 years has been guitar picks! 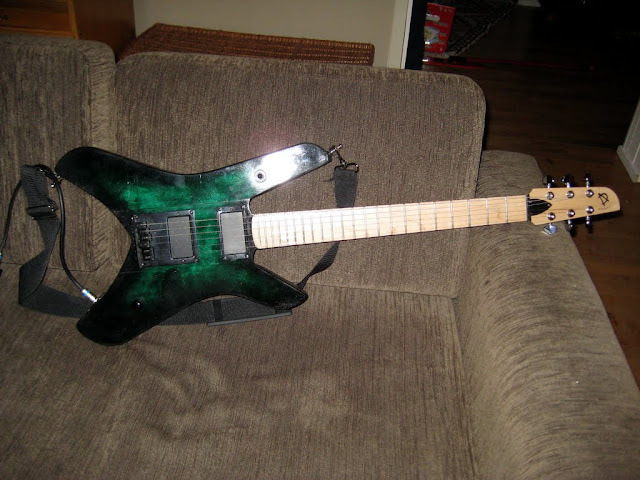 So, i want to get a Fernandes sustainer, but i still want to use my neck and bridge pickups. 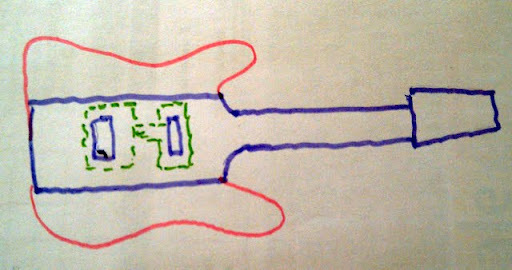 I was wondering if there was a way can wire the sustainer to the toggle switch so it will activate regardless of pickup position. 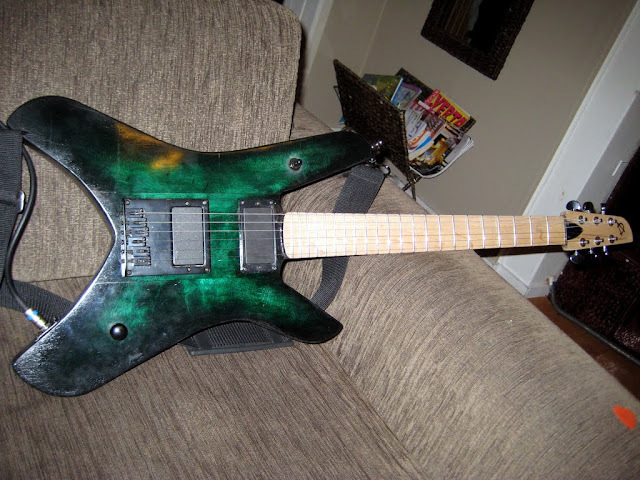 Honourable mentions: G-string, F-hole and speed knobs. Feel free to add more in the comments section. My hiatus is officially over and it's time for an update. and suffered a ligament injury to the thumb on my fret hand, which still hasn't fully healed. One of the easiest and most expensive ways to motivate yourself and practice more is (you guessed it!) buy a new guitar. I am reading Gary Marcus' Guitar Zero. In fact, I finished it tonight. I get it. They're simple concepts, but this is the first music notation that made me roll my eyes and want to go to bed early. I've definitely played more difficult songs than "Ode to Joy." I can't recall playing an entire song on just 2 strings. I can't recall playing an entire song with only 5 recycled, natural notes. So why am I grinning from ear to ear? Because I can read EEFGGFEDCCDEEDD | EEFGGFEDCCDEDCC | DDECDFECDFEDCFG | EEFGGFEDCCDEDCC across a treble staff as fast as you can read it here. I wanted to play the guitar tonight. So I did, but I didn't. I wanted to play the guitar tonight, but I didn't want to practice fretboard fundamentals or learn foundational music theory. I told myself to play the guitar because practice is just practice and it's not really playing. I convinced myself to play/not play. This is perhaps the most insidious trap in adult learning: rationalizing procrastination. In effect, I played myself. Previously, I expressed concern over the inconsistency of thumb placement by my fret hand. Eerily, my pre-recorded guitar teacher addressed the issue tonight. What's scarier is his advice made instant sense and had an immediate impact (paraphrasing): don't worry about your thumb, worry about your wrist--keep your wrist down and your thumb will fall into place. Noble me, I literally started from scratch. I did not fast forward through the pre-lessons like "the parts of the guitar" or "the names of the strings." In recognition of this miracle, I may change my handle to Saint David. Picks of various shapes and sizes? Check! DVD-based guitar learning program? Check! Some backstory: last year I received Gibson's Learn & Master Guitar as a gift. It's a high-end product in this saturated market and emphasizes music theory as much as technique. Plus, L&MG was already an established thing before Gibson funded some reshoots and attached their brand to it. Vote of confidence, right? I got bored with the Floyd on my Yamaha...and the guitar needs a complete work-over anyway...so I ordered a Gibson-style wraparound-bridge and I'll do the Davette thing on the axe...rip out the Floyd, carve a large opening in its place and glue in a big block of new wood...plane it nice and install a fixed bridge. 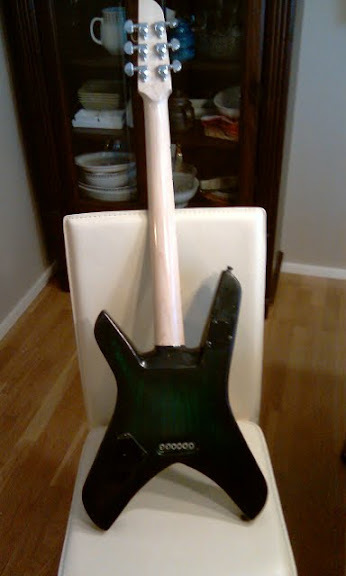 Sand down and slightly V-shapify the neck, re-shape the headstock, sand and re-finish the entire body. Actually cover the front entirely with aluminum. I bought my bar jig at the Home Despot for jig saws. 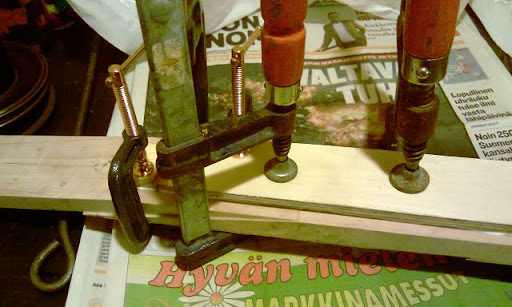 The mechanism for attaching the bar to the saw is really lousy, the vibrations from the saw and cutting would cause it to move. Really useless. So I drilled a hole in the bar and used the plastic handle as a stop for the saw. I put the step drill in the stop bar where I drilled the pivot hole to highlight the hole and to illustrate how the jig works. 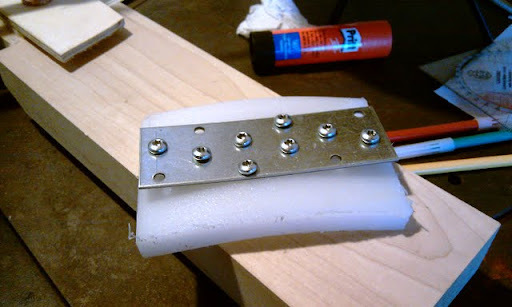 Around Christmas, 2011 I decided that I wanted to build an amp. Originally I planned to heavily mod a Valve Jr that I traded a couple of pedals for...After doing a lot of reading, I decided to go with a PCB from ppwatt.com. I'll build a head, and I need a speaker cabinet too. So I ordered up a Jensen Jet Falcon, 12-inch and a bunch of T-Nuts (part# S-HTN1032) from Antique Electric Supply (AES). Lately I’ve been reminiscing a lot about my musical influences. It started a few months back when I started searching for a new Tube amp. I’ve always been a Fender guy, more out of habit than anything else, my first decent amp was a Fender Princeton stereo chorus and for the last 12 years or so I’ve been playing a HRDlx. I love Fender cleans but a part of me always felt that I was missing out nice dirty tones. Distortion pedals with a Fender amp never quite did it for me - but I got by. It's Ok, not a bad player at all, but even though only slightly, still the neck heaviness bothers me. Furthermore, it still needs a little fret work, at the minumum a re-crown as after leveling some spots are far too wide. It's about done. 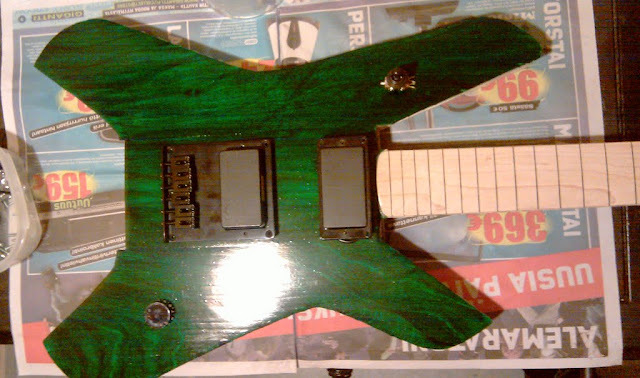 Just the electrics to add for now, once the lacquer dries some. The lacquer is far from great, I really should do a whole lot more sanding and whatnot, but I'm just tired with it so I think I'll finish the build for now. It's just cosmetic anyway now, and looks good from a few metres anyway. If it turns out to be a great player and I'll spend much time on it, I can always strip the parts and give it a better finish then. Lots of issues to deal with still. LOTS. 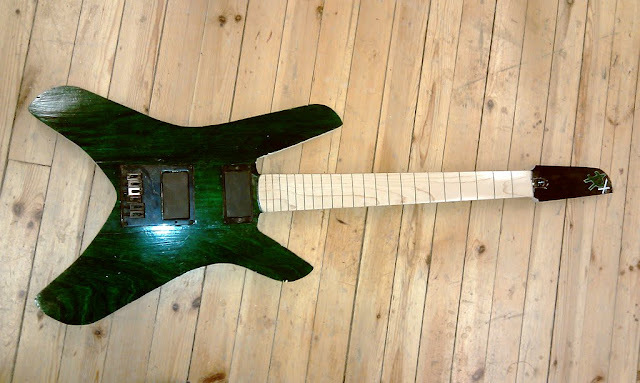 Not to mention the neck still being hugely thick, there's a gazillion little details to worry about, fret ends etc. and there's a couple of high frets as well still. Can't seem to get them properly seated, I'll have to remove and make sure there's nothing in the groove, probably there is something. Ready for fine sanding and such...lots and lots of sanding to do now. The neck has a shape as well but it's too thick as of now. Curious thing BTW...I have all the parts like pickups in a box, and the box weigh just about the same as the guitar with just the wood parts. This is going to be a rather light one! The shape is still rough; there will be a deeper/rounder cut at the back and of course every edge will be trimmed nice, the body is about 1/4 too big almost everywhere right now, quite rough sawn as it is. I wanted to leave plenty of wood for sanding it down nice. OK, here's the whole thing from another angle. Clearly shown the body wood and the overlaying veneer...there will be another veneer for the back, but not with maple showing, all intact from the back. I'll contour the edges some and they will be black, thinking of some kind of sunburst. 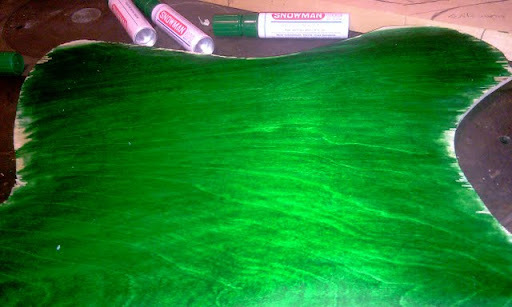 Although white binding would be super cool too..only, that might be a bit much to try to learn how to do. I'm going to leave it 2-tone all the way...so much like it is now. Alright; seems I've settled with the star shape. 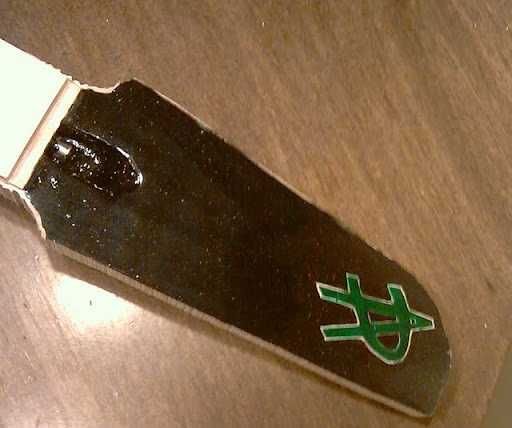 Here's the fretboard glued in place and radiused and the neck part laid over the bottom veneer with the shape marking. 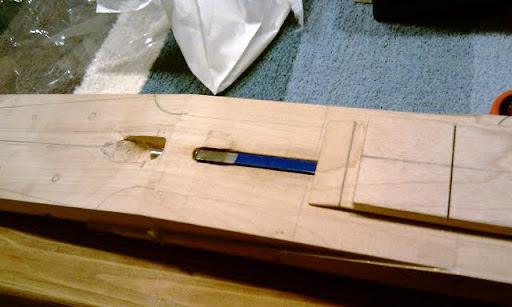 Also the headstock shape now visible; the same knife shape repeats in the body. Alright, now making good progress! Here's how I thought I'd shape the 'wings'. 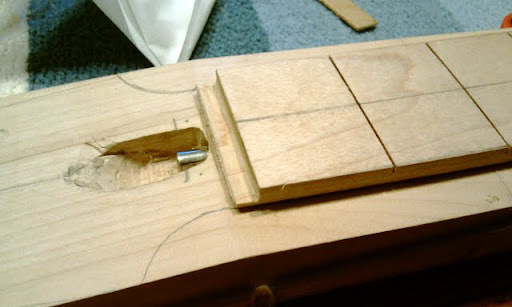 It's shaped so that the neck will sit the same as in strat both sitting and standing, i.e. 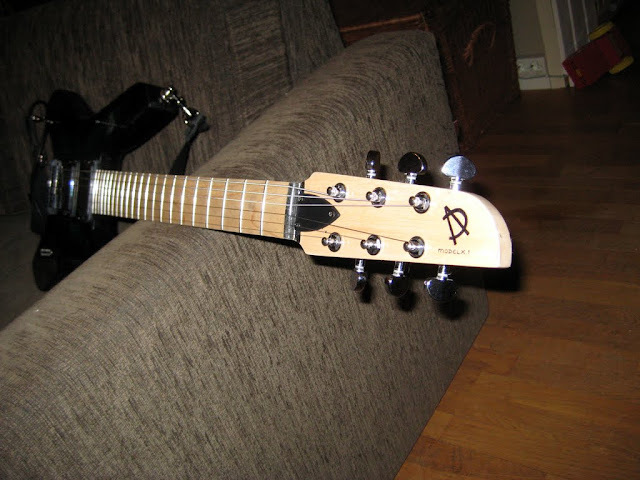 the strap buttons are in the same positions over the fretboard & as far back. It looks smaller than it is because at this point the neck is way wider than it'll be when done...same size as a strat, really. Got the old Dremel out and now the truss rod is installed nice and tight. There sure isn't much wood left under the truss adjust opening, and it was VERY hard to drill the hole from the said opening to the actual truss cavity, so that the 'bridge' of wood under the saddle holds the rod end securely yet the adjustment screw has just enough room to squeeze thru under the saddle and be, well, adjustable. Got the neck rough shaped, still far too wide (as wide as headstock) but much closer to how it's gonna be. 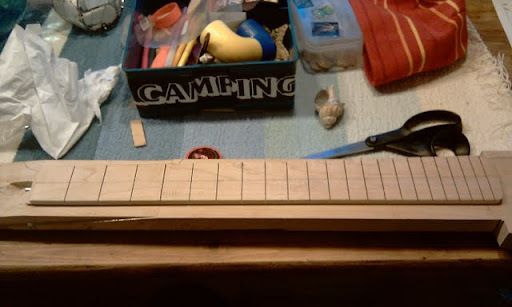 Also got the truss rod channel routed. The measurements turned out OK and it's so designed that when you lay it on the floor etc. the body will rest flat on the floor and the headstock will also just touch the floor but not bend the neck at all like on Gibsons etc. which are tilted also at the body/neck joint. In that project, I am called to play fills and leads over a variety of songs, a lot of which are not blues or blues rock songs in minor keys. Thus, I can't just camp out on the minor pentatonic shapes. Having to learn new things. Working with like 1/3 inch safety margin so far, so as to not make mistakes...will have plenty of wood to work with for a while still. 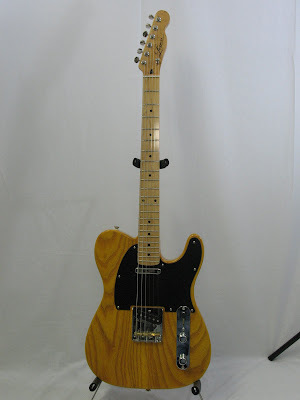 The winning guitar for my Tele quest is the Hell Guitars "No. 2". I've now raw-cut the maple, and I'm going to make the neck with two pieces, the main part will be a neck-thru single maple slab, quartersawn, near the very center of the tree, so the growth circles will nearly match the shape of the neck. 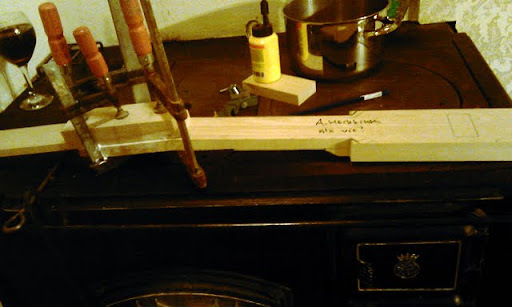 I will make the headstock from the same wood but I've cut a slab that I'll set to the neck at roughly 10-15% angle so that the join will take place under the 2nd fret approximately - from there on the grain of wood will then be lateral to the headstock. Moving this to blogs...never written one but might be better this way, especially when I get photos. I had this big log of maple in the basement, been drying there for at least 7-8 years now. 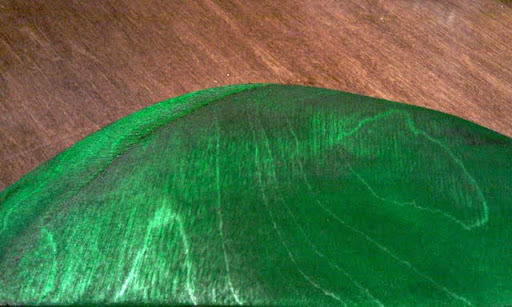 It's about 3-4 inches thick and 1,5 foot wide, long as an electric guitar (over a yard). It's curved and twisted a little over the years as it's dried, and I'm hoping it won't 'live' no more. All times are GMT -6. The time now is 04:14 PM.